A SpaceX Falcon 9 rocket carrying the DSCOVR space weather satellite is fueled for a Feb. 8, 2015 launch attempt that was aborted due to an Air Force radar malfunction. SpaceX now plans to launch the mission on Tuesday, Feb. 10. SpaceX has delayed the planned liftoff of a long-awaited space weather satellite and an ambitious rocket landing attempt another 24 hours, to Tuesday evening (Feb. 10), due to weather concerns at its Florida launch site. 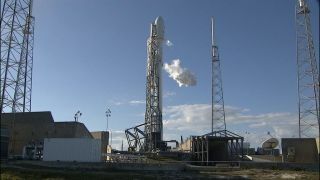 On Sunday, a U.S. Air Force ground radar malfunction delayed SpaceX's launch of Deep Space Climate Observatory (DSCOVR) atop the private spaceflight company's Falcon 9 rocket. The mission was tentatively rescheduled to today, but has since been pushed back another day to Tuesday, when weather conditions are expected to be more favorable for launch, NASA officials said in an update. Liftoff is now set for 6:05 p.m. EST (2305 GMT). "The next launch attempt for the DSCOVR mission will now be Tuesday, Feb. 10, at 6:05 p.m. EST with a backup launch opportunity on Wednesday, Feb 11 at 6:03 p.m.," officials with NASA, the National Oceanic and Atmospheric Administration (NOAA), SpaceX and the Air Force said in a statement. "Weather for an attempt on Monday, Feb 9 is unfavorable. If that attempt were to scrub for weather, we would lose either the Tuesday or Wednesday launch opportunity due to crew rest requirements for the Air Force. Teams will target launch on Tuesday with a backup of Wednesday as weather is more favorable on both of those days. While it is not required for flight, SpaceX will leverage the extra time to replace a video transmitter on the first stage in advance of the next attempt." The $340 million DSCOVR mission is a partnership between NASA, NOAA and the Air Force. The spacecraft is designed to alert scientists 15 to 60 minutes before a potentially dangerous solar storm could impact Earth. Bad space weather can harm satellites in orbit and even disrupt power grids on the planet, potentially knocking out electricity for a wide swath of Earth. Early warning systems can help guard against those potentially harmful issues, experts have said. DSCOVR has a legacy that dates back to 1998, when the satellite was called Triana and championed by then-Vice President Al Gore for its mission, which at the time, was aimed at beaming live views of Earth from space. That mission was canceled in 2001 and the spacecraft placed in storage. NASA and NOAA resurrected the mission in 2009 as a space weather sentry and rechristened the satellite the Deep Space Climate Observatory. Once SpaceX delivers the solar wind monitoring DSCOVR satellite to space, the spaceflight company will attempt to land the first stage of its Falcon 9 rocket on a drone ship in the Atlantic Ocean. Representatives with the company attempted to perform a landing like this during an earlier launch, but the rocket stage exploded when it impacted the ship. Tuesday will be a busy day for SpaceX. The company's robotic Dragon cargo ship is expected to leave the International Space Station tomorrow, bringing experiments back down to Earth from the orbiting outpost. Splashdown of the spaceship in the Pacific Ocean is expected to happen at 7:45 p.m. EST (0045 Feb. 10 GMT). If all goes according to plan, SpaceX will launch a rocket, attempt to land a rocket and land a capsule back on Earth all in a matter of hours.